Einstein's theory of general relativity is a cornerstone of modern physics. It also touches upon a wealth of topics that students find fascinating—black holes, warped spacetime, gravitational waves, and cosmology. Until now, it has not been included in the curriculum of many undergraduate physics courses because the required math is too advanced. The aim of this ground-breaking new text is to bring general relativity into the undergraduate curriculum and make this fundamental theory accessible to virtually all physics majors. Using a "physics first" approach to the subject, renowned relativist James Hartle provides a fluent and accessible introduction that uses a minimum of new mathematics and illustrates a wealth of applications. 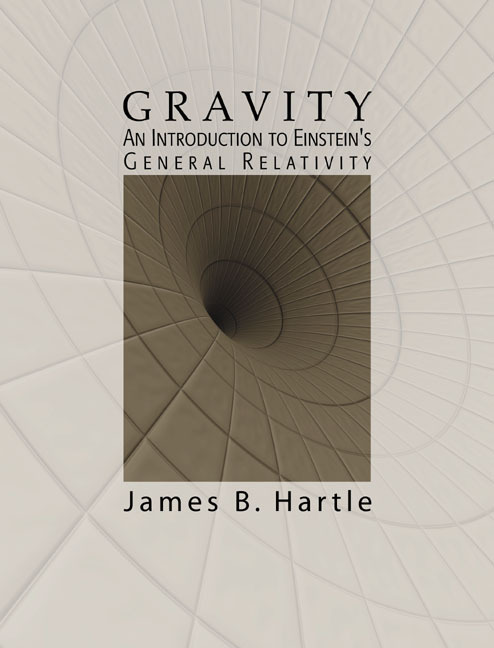 Recognizing that there is typically not enough time in a short introductory course for the traditional, math-first, approach to the subject, Hartle presents a physics-first introduction to general relativity that begins with the essential physical applications. Examples come first, derivations later. In this "physics first" approach, relevant simple solutions of the Einstein equation are presented first, before introducing the field equations of general relativity and their supporting mathematics. This brings the student to the heart of the physical phenomena as quickly as possible. The emphasis is on the exciting phenomena of gravitational physics and the growing connection between theory and observation. Global positioning system, black holes, X-ray sources, pulsars, quasars, gravitational waves, the big bang, and the large scale structure of the universe, for example, are used to illustrate the widespread role of how general relativity describes a wealth of everyday and exotic phenomena. Novel and simple examples are presented to keep the presentation concise and accessible: for instance, Schwarzschild black hole, spherical stars, weak gravitational waves in flat spacetime. Mathematics, beyond the typical advanced calculus knowledge, is kept to a minimum. Only absolutely essential new mathematical concepts are introduced, and these only when needed. The text's layered structure allows the text to be used for a range of courses depending on the length and level of the course—from junior level to introductory graduate level in physics and astronomy. After just the first few chapters, a student will take away a broad introduction to some of the basic phenomena of gravitational physics, and not just mathematical tools. Illustrative boxes are interspersed throughout, providing students with applications, experiments, ideas, examples, and interesting sidelights that extend and complement concepts presented in the basic text without interrupting its flow. I. SPACE AND TIME IN NEWTONIAN PHYSICS AND SPECIAL RELATIVITY. 4. Principles of Special Relativity. II. THE CURVED SPACETIMES OF GENERAL RELATIVITY. 7. Description of Curved Spacetime. 9. The Geometry Outside a Spherical Star. 11. Relativistic Gravity in Action. 19. Which Universe and Why? 20. A Little More Math. 21. Curvature and the Einstein Equation. 22. The Source of Curvature. James B. Hartle was educated at Princeton University and the California Institute of Technology where he completed a Ph.D. in 1964. He is currently Professor of Physics at the University of California, Santa Barbara. His scientific work is concerned with the application of Einstein's relativistic theory of gravitation (general relativity) to realistic astrophysical situations, especially cosmology. Professor Hartle has made important contributions to the understanding of gravitational waves, relativistic stars, and black holes. He is currently interested in the earliest moments of the Big Bang where the subjects of quantum mechanics, quantum gravity, and cosmology overlap. He has visited Cambridge often since 1971 and has collaborated closely with Stephen Hawking over many years, most notably on their famous "no boundary proposal" for the origin of the universe. Professor Hartle is a member of the U.S. National Academy of Sciences, a fellow of the American Academy of Arts and Sciences, and is a past director of the Institute for Theoretical Physics in Santa Barbara.